A scarf is an excellent project for a new knitter or for a more experienced knitter looking for an easy, relaxing project. Even a simple scarf can make a warm, fashionable accessory when knit with yarn the knitter truly loves. The following pattern is for a garter-stitch scarf measuring 8 inches wide and 54 inches long. Knit every row until the scarf measures 54 inches in length. Join new balls of yarn when necessary. Bind off all stitches. Neatly sew in any yarn ends and trim them close to the scarf. Wash your scarf according to the directions on the ball band and lay the scarf flat to dry. Make your scarf wider or narrower by casting on more or fewer stitches. Make the scarf longer or shorter by knitting until it reaches the desired length. Choose a yarn that feels wonderful to knit with. Scarves are simple projects and can become monotonous. An appealing yarn will encourage you to keep coming back to your project. 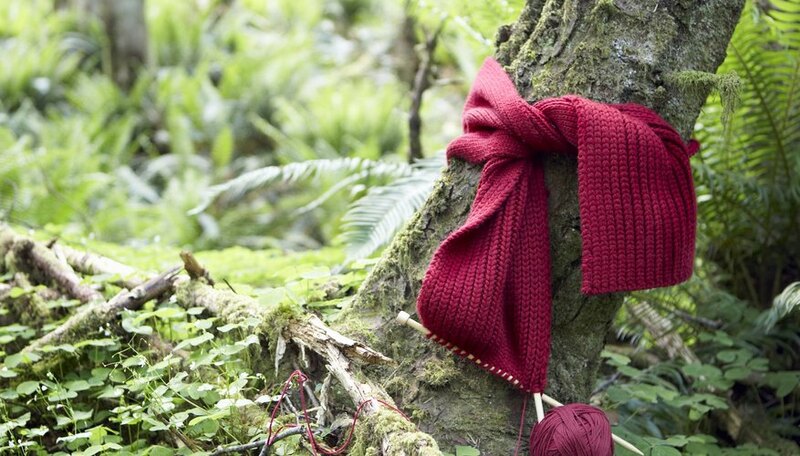 Even a simple scarf can look fantastic when knit with nice yarn. Good quality 100 percent wool yarn can have amazing depth of color, a fuzzy yarn will create a luxuriously soft scarf and a pretty multicolored yarn will create a strong visual impact with no extra work on the part of the knitter.